Chip Hudson’s youngest son is a big fan of his father’s app for iPad and iPhones which allows tennis players to track their statistics. Whether a player wants to analyze their stats by game, set, or match, the information is accurate and immediately at their fingertips. 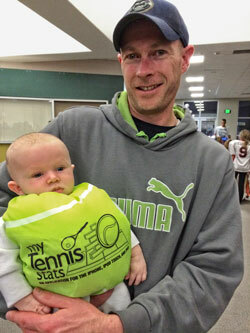 Castle Pines resident Chip Hudson loves the game of tennis, and most days he may be seen playing in and around Castle Pines and throughout the state in tournaments. In addition, Hudson is a software engineer who has been employed by Northrop Grumman for the past fifteen years. In 2009, Hudson combined his talents and passions and created his own application “My Tennis Stats” (MTS) for the iPhone and iPad. MTS is an amazing app that allows tennis players to easily track their statistics during matches. In the past, coaches, parents and friends were tasked with charting statistics such as volleys and double faults for both professional and serious recreational players. Often high school players play up to seven matches, and the charting process is very labor intensive, although necessary in order to improve the player’s game. Hudson is a Colorado native who lives in Castle Pines with his wife and three young boys. “We just love the people and the area, and our 10-year-old really enjoys Timber Trail … so that’s a plus also!” Hudson feels confident about his products and is excited about the prospects for his company. MTS (for the iPhone, iPod Touch), My Tennis Stats HD (for the iPad), and My Tennis Stats Lite (free version) have been downloaded more than 28,000 times in more than 100 different countries and are available in five different languages. Hudson is also extremely focused on providing excellent customer support. During the past five years that the product has been in existence, Hudson has made several changes to the product based solely on customer feedback. For more information on MTS, visit www.HDSoftwareTech.com or search for “My Tennis Stats” in the App Store. MTS is currently available for Apple products and an Android version is in the works.